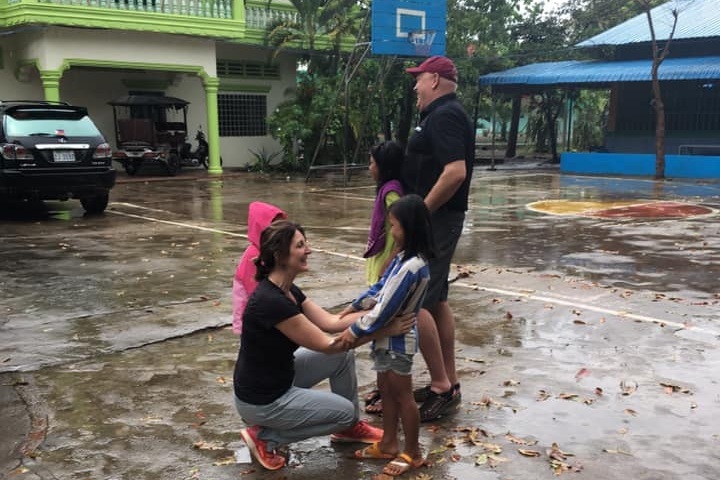 SSM Founder Jay Arntzen writes about the team’s recent trip to Cambodia to explore new partnerships and visit our current partners! Our trip started in Phnom Penh after 24 hours of travel. We were met by our dear friend Pastor Sihok, who graciously met us at 11 p.m. and took us to our hotel. Our next day was spent visiting three of our Baskin-Bowler Scholarship students, Sopheak, Sona and Pov, at their schools. We learned how their studies are progressing, the status of their spiritual development and social life, and what their challenges are so we can improve our support and pray for them. Adam and I met with two new missionaries from LifeSong, Nate and Allie Stevens, to learn about their orphanage in Takeo province. In the evening we hosted a dinner celebration with our four Next Steps students in Phnom Penh and with Pastor Sihok, his family, and the two orphans that live with him. We met up with our favorite driver, Bunny Travels, and he took us to Kampong Thom to meet up with our friends at Bileg Solid Rock Children’s Home. Dr. and Mrs. Castro met us on arrival, and we were whisked away to one of their feeding centers where the kids from Solid Rock were feeding the children of this poor village. After our joy of seeing the kids and all of the hugs, Sondra (a retired veteran school teacher) took over and shared some songs, games and goodies with the village children. It was pure Joy to see our SSM kids serve other poor village children. We then went back to the children’s home and toured the new kitchen that was funded by SSM and its donors. Now all of the food preparation and eating facilities are under one roof, improving the sanitation and safety of the cooking process. Visit to the local Dam area and Water Park. These were days for fun and relaxation with the children. It was also a time of deeper communications and sharing. This was my favorite time on the trip because we got to pour into the kids and have fun with them. Later in the days our team played basketball and volleyball with the kids and we celebrated them at dinner the evening of the 4th day by giving gifts from their parent partners as well as gifts to those who have yet to be matched. We also shared love with the staff by giving gifts and love offerings. Off to Poipet, a 6 hour drive, to meet with Steve Hyde of Asia for Jesus. Steve has served in Cambodia since 1993. You can learn more about his ministry at http://www.asiaforjesus.org/. Steve and his wife Noit have been faithful servants of our Lord and it was a treat to learn, see and discover all that God has done through their ministries. In 2003 they started a ministry called Imparting Smiles in which they have 47 single or double orphans in a Children’s home in Poipet. Also on this property, they have a covered soccer field and church. They also have a local school for the center’s children and other vulnerable children in the community. We believe this is an excellent opportunity to partner SSM with Imparting Smiles, so we covet your prayers as we discern God’s guidance. We then loaded back into Bunny’s van for a trip to a Christian center that Bunny’s Church runs and back to Siem Reap to spend the night. This was a day of R&R and reflection prior to returning home. Steve, Sondra and Adam headed to Angkor Wat Temple, one of the 7 man-made wonders of the world. Tracy and I stayed back to meet with our dear friend Pastor Joseph who is recovering from kidney cancer. It was a blessed time as we learned more about his journey with cancer and his faithfulness. Later that day we headed to the airport for the 26-hour journey home. It was a busy, short trip but we believe that we achieved our objectives. Of course anytime Tracy and I get to spend time with Vichika (aka Susan), Mesa and Grace we are all in! Steve and Sondra also share our love and passion for their two kids Soun Mesa and Buntheang. It is always hard for me to leave them behind but we all know that we will be back, and the skype calls, emails, texts, etc… keep us close and connected to them and those that care for them. We will be heading back to Cambodia for our annual trip in August and I already can’t wait to take this team of 20 to meet the kids and our friends. God’s blessing on all of us is overwhelming!